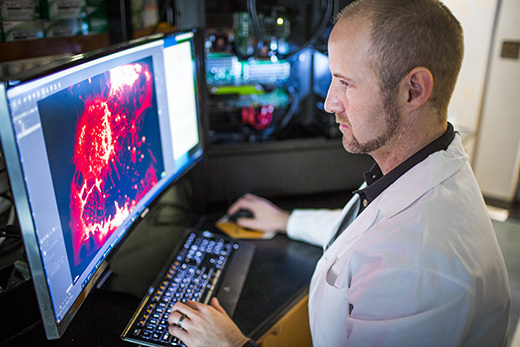 Neil Anthony, PhD, an assistant scientist in the Integrated Cellular Imaging Shared Resource, views a cancer cell magnified through the lattice sheet microscope. Winship Cancer Institute is one of only 15 sites worldwide to acquire and install a lattice sheet microscope, novel technology that will change the way researchers are able to visualize live cells. Unlike conventional microscopes, lattice light sheet microscopy allows investigators to view live cells at the highest combined 4D resolution attainable (three spatial dimensions and time). The system integrates two orthoganol or perpendicular lenses that are perfectly matched. A thin sheet of light is made up of multiple beams in a lattice providing optimal illumination of the sample. "This microscope will allow us to probe how living cancer cells behave in real time with unprecedented spatial and temporal resolution," says Adam Marcus, PhD, director, Emory's Integrated Cellular Imaging Shared Resource. Another advantage of the lattice sheet microscope is that over time it causes minimal light damage to cells. "You can start to see processes that you couldn’t see before on a normal microscope. The speed at which cellular processes occur are often so fast that you can't properly see them under a regular microscope," says Neil Anthony, an assistant scientist in the Integrated Cellular Imaging Shared Resource. Acquisition of this novel technology was supported by a partnership of Winship and the Georgia Research Alliance.